Are you guys not clicking the thread icons to go to the first unread post...? Those links don't work everywhere. For example, via the quick links such as "active topics" or "unread posts", or with some browsers and/or operating systems. It's the inconsistency of all of the functionality that I find is the most annoying thing about the new site. I'm sure that if everything worked the same everywhere then we'd all soon get used to it, and accept it. Speedbored, clicking the timestamp under the username that shows who made the last post, to the right of the topic, takes you to the last post every time. Regardless of if there has been a new post, you have read it, or not. Klicking the icon that indicates new post takes you to first unread post. Yes, I am aware of that, but I always want to go to the first unread post, not the last one. And the first unread post does not work from the quick links lists. Yeah, the only place I notice this is the "your posts" list - where I tend to just open the first post then click "read first unread post"
It also works in individual fora. Like I said, it's the inconsistency that's the annoying thing - you have to remember to modify how you use the site according to which page you're currently in. The hamburger stack at top left, before "forum" and "faq"
Ah, I see and you are right, no skip to first unread as far as I can see. 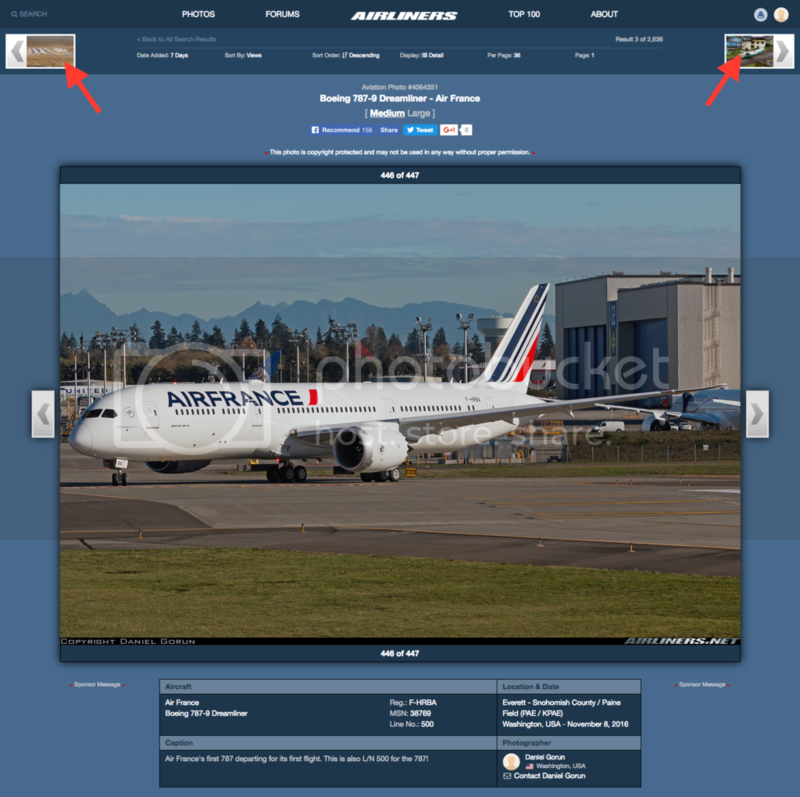 Update 2/2: We have added a new feature to the photo details pages. When you do a photo search and click through to a photo details page, you'll now be able to browse to the next/previous search results without having to go back to the search page. I preferred the new one. Could you make a way in user settings to choose old style or new style, or is that not easily possible? Excellent! So glad to see this style back. It's not easy to make it so that you can choose between the old style or the new style. At this point we're most likely to stay with the new photo details page that you now see. Is this the case for photos from the database or photos linked from outside A.net? No image shown in Chrome. All shown in Safari. Images are hosted on a third party website (flight-report.com). Conversely, I saw images displayed correctly in other threads, regardless of origin. Thank you for bringing back the style of photo information we were used to - I for one find it much easier to look at and interpret. Am I right in saying some of the fields which had been implemented in the previous one (I think there were ones for camera equipment etc?) are not shown in this new one? It might be nice to include that if possible. I imagine there will be others too who preferred the older style. I'm not one of them, although I was getting used to it. It might be nice to hear which aspects of it specifically were liked, in case some of them can be implemented into the newer style to create something that everyone is happy with. As an aside, it's not surprising so many people feel so passionately about any sort of aesthetic change to the site, such as the change from the original to the new (now old) photo detail format. A glance at any thread about an airline implementing a new livery (which didn't involve significant aspects of previous liveries) should give the impression that the generality of users on this site dislike aesthetic change, with a minority (like LamboAston in this case) actually enjoying the change. Of course ten years down the track everyone has come to love the livery and complains when it changes again! Anyway, I know there are lots of complaints all the time, and there are many things which are no doubt worthy of complaint, but to the crew working on this site, thank you for your effort - having been there and done that over a decade ago, I know what a frustrating task it can be! I'm so happy the old photo-viewing format is back! Thanks to everyone involved in this update! 1. Rename "Caption" to "Remark". 2. Rename "Location & Date" to "Taken at". This is only particular to the individual photo viewing-page and "Location & Date" is correct for viewing many photos on a single page. For example the Top 24, 48 hours is OK as "Location & Date" but on the individual view of a photo as "Medium or "Large" it should be "Taken at". 3. Place the registration # and c/n in front of the remark instead of to the right of the aircraft type. 4. Line the info box with the width of the "Medium" sized photo. This would make it exactly like the old site but it's fantastic as it's right now! The viewing experience has gone up IMO and if these changes can be implemented then that would be awesome! That's odd, because I'm currently viewing this in Chrome and when I clicked the thread you linked, all images show without a problem. Theseus, Most likely a glitch in your Chrome installation. I have tried Chrome, IE, Edge, Firefox and Safari on a Win7 machine, and Chrome and Safari on IOS with no issues. Make sure you are not blocking third party content in Chrome, but if they were blocked you wouldn't see any external images at all. Do you use an ad blocker? If so, try turning it off and see if the images appear. Thank you for switching back to something like the old format. I like not having to scroll down to see the photo caption (after all the camera info). You can set that in your settings on Airliners start page. Till last week I selected a photo and then scroll down see more info. I was interested in info like where the photo was taken and the comment of the photographer. That's gone now. Where can I find such info if it's still availabale 'somewhere'? Thanks for your reply and Sorry!, didn't see that, sloppy! Apologies if an answer to this has already been posted before. The old site had a handy feature whereby if a post contained an airport or airline code you could hover over it and a little window popped up with the full name. Can this be re-activated? Thanks for your help, an ad blocker (AdBlock ---not AdBlock Plus) was indeed the culprit, so I will turn this one off. Site looks good. Any updates on First Class Membership? Can we cut the new "Latest Additions to Airliners" element in the forums down to a single line of photos? Personally I would prefer if it just wasn't there but I suspect it is here to stay. Being two lines though, it takes up more room than a single post and ends up making it look like the topic is over (rather than continuing on below) since for me it is exactly where the bottom of the thread would be if it were only three posts. Here, here! When I am in a forum reading a thread, I am in the forum to read the thread, not see the latest photos on the site. Not to mention, not a fan at all of it being repeated at the bottom of the page along with the top searches... the same searches that I could access through the photos section when I want to look at photos. Agreed on the photo additions- if it has to be here, I'd prefer to have it banished to the bottom of the page, rather than inserted between posts. I got ABP to avoid things like that on the old forum, so I can't say I'm super thrilled to have it back, even if it's "official" site content. It needs to go entirely, or be moved to the bottom of the page. Ridiculous "feature". First off, thank you for bringing back the "classic" photo viewing window. Seeing website photos in their full resolution and quality is what made this site such a powerhouse over the years. 1. 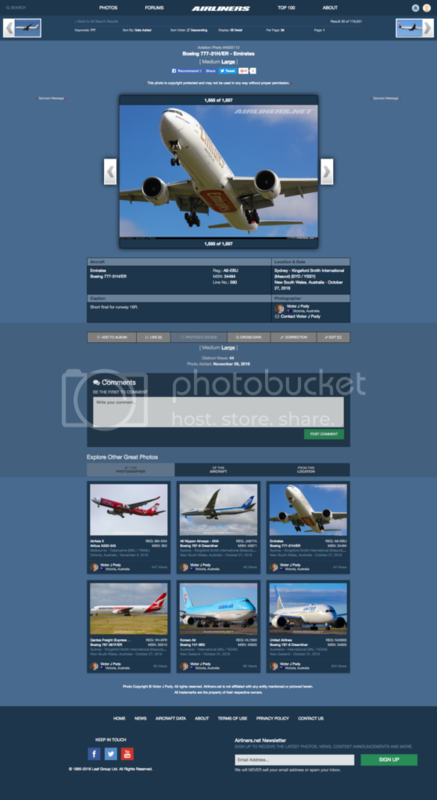 Airliners.net was founded as a photo database. And today, I'd wager a majority of the traffic on the site is people surfing for and enjoying the photo content. Sadly, with the new design, when a user does a photo search the results are displayed in a "2 by 2" format. Unlike the old design where the user could simply scroll down and go from photo to photo, now a user is forced to dart their eyes around to glean all the photos as they're displayed on both the right and left hand side of the screen. >> Also, the photo thumbnails are roughly 1/2 the size of the old design. Photo Content is an anchor product of this site. When you cut down the display size of the thumbnail and stack them 2 x 2, it makes the photo viewing/searching task exhaustive on the eyes and frustrating since it doesn't "flow" down the page. Please consider re-instituting a LARGER thumbnail and SINGLE display down the page. 2. When a photo thumbnail is clicked on to view, rather than opening up in it's own window, the website opens the photo in the same window that originally displayed the search results. This is extremely annoying as now when I click out of the photo to return to the search results, I've instead closed out my airliners.net window! Back to the home page I must go to re-run the search and sift back to where I was. It was always nice to open up numerous photos during a search to do side by side comparisons, sharing, etc. Please consider bringing back the separate window option when a photo is clicked on. I haven't contributed any photos since April 2016 and I'm still on the fence if it's worth my time and effort to bring photos to a site that is crippled with a "new design" that has become difficult to navigate. The old design reflected a refined evolution of a system that made the display of photo content it's #1 objective. Sadly, earlier this year the management of this site abandoned that evolved design in favor of what is "trendy" in an instagram/flickr world. If you make the site just like Flickr then Airliners.net loses it's niche. Thank you for making the first few changes back to the old way, and please keep them coming! The photos between the forum posts kinda caught us by surprise (atleast me), but it's probably here to stay. I guess it's one more way to try to increase photo views, but I also understand it's an annoyance for the forum users. I've E-mailed the developers and asked them to reduce the photos to only 1 line and to place it more in the middle of a thread (between post #25 and #26). Thanks for your extensive feedback, much appreciated! I agree. There is a button on the right side, just above the search results, that enables you to swotch to the card mode. I prefer viewing the photos like that for the same reasons you mentioned above. The only downside of that is that for 16:9 ratio photos, the sides get cut off. But personally I'm not too bothered about that. Fully agree and one of my biggest pet peeves right now. I put it on the list again the other day, but will E-mail the developers again after this post to see if it can be done. I hope we can enjoy your photos again here in the future. I don't particularly like it but it isn't a great annoyance and it is increasingly common. The major newspaper in New Zealand has started doing it - putting links to other news stories in the middle of an article. It's clickbait. I'm completely accustomed to the new site now and I don't weep for the past, but - after all these months - there are a couple of things I still sorely miss, such as the flags beside the user name and the (general) age group of the poster. A lot of the threads are region specific, Australia and/or New Zealand, for example, and some posters not from that area do have extensive knowledge of the region. But when I read ill-informed posts in either, I'll be more understanding in my reply to someone who isn't from that part of the world. Similarly, the age group thing. I welcome young members but often they don't have extensive knowledge of a subject, and, again, I'll be more understanding if I know they're young. The new latest photo additions feature is really annoying in the middle of the thread. It breaks up the flow when reading downwards and I don't think reducing it to one row will do much to help. I do however, really like it placed at the bottom of the thread pages. After finishing reading the thread it allows me to have a look at some photos which is what I usually do anyway. It also doesn't get in your way if you have just come to read. Good news: I got rid of the latest photos within the thread quite easily using uBlock Origin. Just use the element picker and select the latest photos box. I don't like it either. I am reading, not viewing photographs. To put it in the middle of the thread is a really bad idea. Yes, I think the whole clickbait thing in news articles are also what I find annoying here about these inline photos, and two rows makes it even worse. I am also one who has welcomed the new site, although many improvements have been made since June, with more still to come hopefully. I too miss the flags, but I can see how discussions are sometimes better without them. I agree, it helps to know where the user is from, and I do go into the profile using the main URL if I really want to know, shouldn't need to do this though, it should be on the mini user profile at the very least then, if not near the avatar in-thread. Poll topic? The age group thing, as with flags, it does depend on users being truthful. This was not always the case. At least on the old site, there was a range, and it was an essential field, now it's optional. I find age more useful than flags, again, if it is indeed accurate. My timestamps have been busted since the website first released, any updates as to when this will be fixed? Last edited by JohnKrist on Sat Nov 19, 2016 6:53 pm, edited 1 time in total. Forum searching is very hard if you don't use the same words as the post. Anyways the 2nd link fixed my problem so thank you very much! 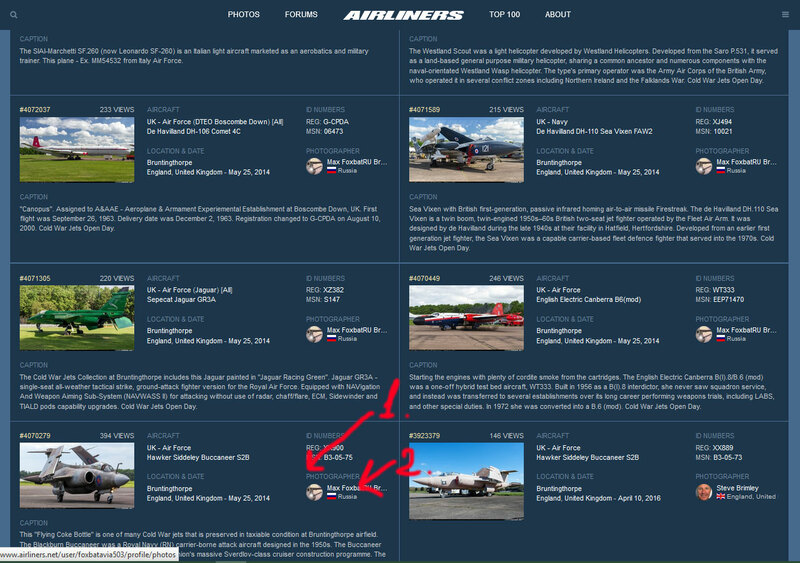 I agree with all other comments complaining about the big "Latest additions to Airliners.net" photos banner that appears after the first few forum replies. It's already at the bottom of the page. No need for it to appear twice. And it's not an ad since it's referring to A.net, so what's the point of it? When you see that appear after a few replies I think I've come to the bottom of the thread, and took me a while to realize that the forum continued after scrolling past that banner. Another suggestion I may have made a long time ago -- Can the little "jump to" link box near the top right hand corner of forum pages that lets you quickly go from one forum to another be made white so it stands out against the blue background?. The little dark blue box is now almost invisible with the medium blue background. Same comments apply for other dark blue text links on the same line on the left side of the page, although I don't really care about those, but I use the "jump to" link very often. Many members probably aren't even aware it exists since it's so hard to see. I didn't even realise that box existed. I do have to say though that even if it had been more visible previously its function is not that obvious. If you hover over it you see "Jump to" but it's not until you click on it that you realise it jumps to other forums. Perhaps the hover should be changed to "Jump to forum"? Thank you for bringing back the "classic" photo viewing window! Now not only become more beautiful, but also faster. 1. In the main search form (as on the attached picture) it is desirable to add a reference to the codes. Many military aircraft there and "Registration" and "Code". And sometimes useful sort on the field "Сode". 2. Now when you click on the name of the photographer, we find ourselves in his profile. I believe it is very few people interested. Much more useful to be able to get all the latest photos of the photographer in a form that shows the data and the type / location / date (sort of like in the attached picture). Type, as in the profile is not informative. 1: The code is visible when you open the photo. It's not desirable to list the code in the overview of the search results, simply because there isn't enough space. Doing so would require more use of space and in turn means more scrolling. This is what we're trying to avoid. 2: This is one the list to be fixed. If you decide to go buduyuschem one column instead of two, and if this come up too much space, it may be reasonable to return to the question of "Codes". Will it be possible to see the "Mil SN" "Mil SN (P)" and "Reg (P)" categories removed and/or merged back into the reg category? It doesn't really make sense to divide things up like that, and I recall seeing several cases before the display format switch where one aircraft would have its reg listed in several different categories, such that a search for one wouldn't display all the photos of the given aircraft.